“Phi Ro Peppers” company, based in the coal regions of Northeast Pennsylvania has created a hot sauce; ‘Dat’s My’En’. This sauce was born out of a passion for germinating, growing, processing, and consuming hot peppers. 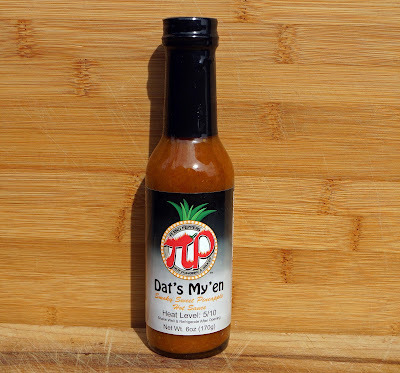 “Dat’s My’En” is a unique hot sauce name that originates from a local coal miners dialect which translates to a ‘possessive mine’ meaning. The sauce is a combination of habaneros, chipotles and pineapple. Phi Ro Peppers claims this sauce is a burst of flavor and heat that will add tropical flare to chicken or fish. It also goes good on vanilla ice cream. We shall see. 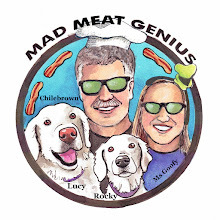 Come join us while we try ‘Dat’s My’En” hot sauce. Pineapple juice (water, pineapple juice concentrate), fresh pineapple, agave syrup, ground mustard seed, vinegar , fresh habanero peppers, modified corn starch, fresh lime, salt, turmeric and spices are the listed ingredients. On the label chipotles are listed as an ingredient but the listed ingredients do not include chipotle. A fresh, clean, sweet smell of pineapple nectar greets your sinuses with an opened top. A hint of cinnamon and smoke is in the background of this pleasing smell. This is a very thick puree of ingredients. There are no flow restrictors on this bottle because it does pour slowly. No seeds are present. Pineapple is the star today. We first notice pineapple goodness. The chipotle flavor demands your attention with the addition of slight smoke. 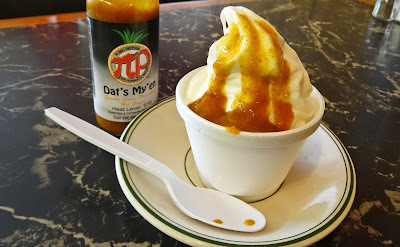 The habanero pepper with it fruity tones pairs well with the pineapple to give this sauce a bold flavor The agave syrup with the pineapple gives it just the right amount of sweetness. The lime gives this sauce freshness. I also taste a little hint of cinnamon. I like the heat level that grabs your attention but does not punish. 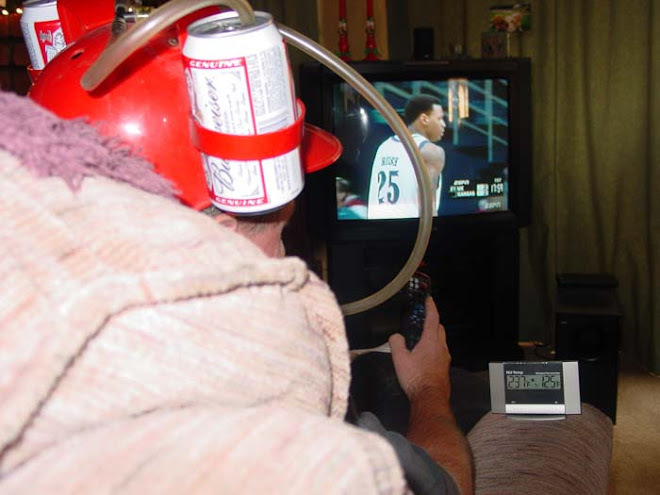 There is a whole lot going on here. . The all important factor of balance is working today. The label states that this sauce level ranks a 5 on a scale of 10. This is a little to generous for my heat ranking. This sauce is not mild but will not scorch either. I will give it a click above mild with 2 stars out of 5 on the heat meter. Who doesn’t love meatloaf on a blustery winter day? A couple of shakes of ‘That’s My’En’ elevated this comfort dish to greatness. The sweet/hot combinations of flavors pair well with our beloved meatloaf. Yummy. Barbequed chicken wings are our favorites. We added a little melted butter to the sauce and coated our cooked bbq wings. This was a success. The sweet pineapple, the smoky chipotle and a little kick from the habanero made these wings great for any occasion. Lastly, you know I had to try it on some vanilla ice cream. The things I do in the name of hot sauce research. Granted the sauce is great and I do love ice cream but this may be a stretch in the pairing department. ‘Dat’s My’en’ is a unique name for a fun sweet/savory sauce. This sauce has something for everyone. It has heat from habaneros, smoke from chipotle and the sweet flavor of pineapple to balance and complement flavors. We loved the sauce with our wings. Meatloaf was comfort food elevated a couple of notches. Vanilla ice cream? It was not really my cup of tea. Dat’s My’En will receive this reviewers seal of approval. I know you will like it too. Sure does look good on the ice cream! Greg, This was a little too much even for me.